The Château de Montsoreau-Museum of Contemporary Art, situated in the Loire valley,is a private museum open to the public. The project was initiated in November 2014, and was inaugurated the 8 of April 2016. The permanent collection, gathered over the past 25 years by Philippe Méaille, is not only intended to be exhibited at the Château de Montsoreau, but also to be lent to other institutions. His collection is the world's largest collection of works by the radical conceptualists Art & Language, who has played an important role in the invention of conceptual art. The Philippe Méaille collection has also been on long-term loan since 2010 at the MACBA of Barcelona, which brings the two institutions to collaborate regularly. Art & Language, Art-Language Vol. 3 Nr. 1, 1974, Collection Philippe Méaille. The first long-term loan of the Philippe Méaille collection with the MACBA is the subject of a retrospective exhibition Art & Language Uncompleted: The Philippe Méaille Collection in October 2014. A catalog was produced in close collaboration with the artists of Art & Language (Michael Baldwin and Mel Ramsden), as well as academics such as Carles Guerra (chief curator at MACBA) and Matthew Jesse Jackson (Professor in the Department of Visual Arts and Art History at the University of Chicago). Philippe Méaille, who has lived for 15 years in Anjou, worked in parallel with Christian Gillet, the president of the department of Maine-et-Loire, to study the possibility of creating a museum of contemporary art in Anjou, and to install his collection in the château de Montsoreau, a departmental property. After six months of studies of the alternative offers, a polemic was released by press leaks. Frédéric Béatse, then head of the left wing list in the regional elections, regrets that the right-wing majority of the department of Maine-et-Loire is "throwing away the family jewels", and that "This is all the more shocking as Jacques Auxiette (then president of the Region Pays de la Loire) had proposed to the Department council a partnership between the Abbey of Fontevraud and Montsoreau to make this Saumur area even more attractive." Christian Gillet, president of the department of Maine-et-Loire made his decision on Friday, June 19, 2015 and gave the keys of the Château de Montsoreau to Philippe Méaille according to an emphyteutic lease of 25 years. At the same time he engaged a reflection on contemporary art as a cultural and touristic priority for the development of Maine-et-Loire. At the beginning of the 20th century the castle of Montsoreau was almost a ruin. 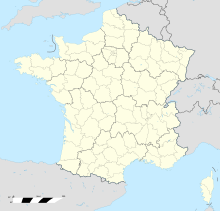 It was saved by an active policy of acquisitions and restoration of the department of Maine-et-Loire under the direction of the bâtiments de France. Thanks to the last renovations, the historical monument is up to standard and include an elevator. The electricity is now up to standard as well as emergency equipment and fire detection equipment. The lighting benefits from the latest technical developments and has LED (Light Emitting Diode) on all its reception and exhibition spaces. Limewash, which is extremely degraded, has been recovered with traditional lime-blossom. These whitewashes, common in châteaux of the Loire Valley, have the virtue of installing a constant hygrometry. During the redevelopment of a former storage room, the masons discovered a chimney dating from about 1450. This chimney is currently being studied in collaboration with the bâtiments de France to be restored. These works allow the Château de Montsoreau-musée d'art contemporain to have at present 2,000 square meters of exhibition space. A library on the history of art, contemporary creation and applied arts opened in August 2016. The château de Montsoreau-Museum of contemporary art port reopened at the end of May 2017 after several months of work, to allow its visitors to arrive by boat. Since more than a thousand years, the castle of Montsoreau is the gate of Anjou and now the only Château de la Loire to be a museum of contemporary art. Historically built by one of the ambassadors of Charles VII King of France, John II of Chambes is the first of Kingdom's Lords, with Jacques Cœur to install the Italian Renaissance in France. He built the Château de Montsoreau between 1443 and 1453, directly by the side of the Loire, like Venetian palaces built during the same period. The Philippe Méaille collection, which constitutes the collection of the museum, is installed on the first two floors of the museum. It is composed exclusively of works by the artists group Art & Language. An agreement with the Tate Modern of London authorizes the screening of a film co-produced by this institution and the Bloomberg foundation to be exhibited inside the Château de Montsoreau-Museum of Contemporary Art. Founded in 1968, Art & Language – which takes its name from the eponymous newspaper Art-Language – is made up of British, American and Australian. Their corrosive questions about the status of the artist, the work of art or even the institution itself make them seen as the most radical figures in the history of art of the second half of the twentieth century. This collective, at the origin of what is now called conceptual art is still active and currently represented by Michael Baldwin and Mel Ramsden. Between 1965 and now, up to fifty artists have joined or collaborated with Art & Language, including: Terry Atkinson, David Bainbridge, Michael Baldwin, Ian Burn, Charles Harrison, Joseph Kosuth, 28 Sol LeWitt, Philip Pilkington, Mel Ramsden, Dave Rushton, Lynn Lemaster, Mayo Thompson, Kathryn Bigelow, Dan Graham and Lawrence Weiner. In 1977, when Mayo Thompson, leader of the band The Red Krayola left the collective, it was composed of Michael Baldwin, Charles Harrison and Mel Ramsden. The Philippe Méaille collection is presented in such a multiplicity of media (paintings, sculptures, drawings, manuscripts, tapuscrits, installations and videos) that Carles Guerra will say of it: "besides being affected by the artists' attitude, The Philippe Méaille Collection is further affected by the archaeological perspective with which it was assembled." 800 works from the Philippe Méaille collection are still on long-term loan at MACBA since 2010. In 2014, MACBA devotes a major retrospective exhibition to Art & Language, under the direction of Carles Guerra: Art & Language uncompleted: The Philippe Méaille Collection. Temporary exhibitions are giving an access to contemporary art from 1965 to today. 2016: Agnès Thurnauer, a History of Painting. 2017: Ettore Sottsass, Designer of the World. 2018: Art & Language, Reality (Dark) Fragments (Light). 2018: 1968: Sparta Dreaming Athens. Since its opening, the Château de Montsoreau-Museum of Contemporary Art collaborates with the National days of Books and Wine in Saumur, to reward an art writer with the François Morellet prize. 2016: Catherine Millet, art critic and artpress redactor in chief. 2018 Eric de Chassey, director of the National institute of art history. In 2017, the gardens of the castle, located on the banks of the Loire have been transformed into wild gardens. On more than one hectare, the garden gives way to freedom and biodiversity, a peaceful, inspiring and perpetually evolving place. Passionate about nature, Miriam Rothschild (1908–2005) devoted all of her life to her scientific research and literally cleared the traditional approach of gardens to create "natural" gardens. Its Ashton Wold property, located in the north of London, was a real laboratory for conducting environmental experiments and creating these "wildgardens", nowadays so widespread. Leaving technique, chemistry and interventionism, the wild garden favors the sociability of native plants and preserves the surrounding fauna. It proposes a new balance between fauna and flora. 2017: Wild Gardens, Tribute to Miriam Rothschild. 2016: Philippe Méaille, Forumidable, ENSCI, Paris. 2016: Art&Language, Philippe Méaille, Guillaume Desanges [fr]. EXPO CHICAGO, USA. 2017: Christophe Le Gac [fr] : Ettore Sottsass super-héros du design, Château de Montsoreau-Museum of Contemporary Art, Montsoreau. 2017: Philippe Méaille, La valeur de l'Art, École nationale supérieure des Beaux-Arts, Paris. 2017: Fabien Vallos, Chloé Maillet, Louise Hervé, Antoine Dufeu, Arnaud Cohen, Protest 1517-2017, Château de Montsoreau-Museum of Contemporary Art. 2016: Rod Mengham [fr], Un tour chez Agnès Thurnauer. 2016: Art & Language, Entretien avec Victorine Meurend. 2017: Art & Language, Affiche: Almost a Home for Homeless Stuff. The Château de Montsoreau-Museum of Contemporary Art supports an active programme of loans to other institutions locally and Internationally. 2016: Art &Language – Kabakov [fr], The non objective world, Art Basel, Switzerland. 2016: Art &Language – Kabakov, The non objective world, Gallery Sprovieri [fr] et Jill Silverman Van Coenegrachs [fr], London, UK. 2016: Collection MACBA 31, MACBA [fr], Barcelona, Spain. 2016: Art & Language, Paintings I, 1966 – These Scenes 2016, Carolina Nitsch [fr] Gallery, New York, U.S.
2016: Art & Language, Made in Zurich, Galerie Bernard Jordan [fr] et Jill Silverman van Coenegrachs, Paris, Zurich, Berlin. 2017–2018: Soulèvements, Jeu de Paume [fr], Paris, Barcelona, Buenos Aires, Mexico, Montréal. 2017: La comédie du language, Galerie Contemporaine, Chinon, France. 2017: Art & Language, Kangaroo, Fondation Vincent van Gogh [fr], Arles Contemporain [fr], Arles, France. 2017: Luther und die avant-garde, Wittemberg, Berlin, Kassel, Germany. 2017: Art & Language, Homelessstuff, Galerie Rob Tufnell [fr], Cologne, Germany. 2017–2018: Art & Language, Ten Posters : illustration for Art-Language, CCCOD [fr], Tours, France. ^ "L'Art contemporain réinvente Montsoreau" (in French). ouest-france.fr. 2016. ^ "De l'Art Contemporain au Château de Montsoreau". ouest-france.fr. ^ "Le château de Montsoreau devient un centre culturel d'Art Contemporain". saumur-kiosque.com. 19 June 2015. ^ "Le Château de Montsoreau à l'ère Conceptuelle" (in French). lemonde.fr. August 2016. ^ "Largest collection of radical conceptualists Art & Language finds home in a French château". artnet.com. 2015. ^ "Philippe Méaille installe sa collection au Château de Montsoreau" (in French). connaissancedesarts.com. 2016. ^ "Quand la peinture sort de sa toile : Art & Language à Montsoreau". AOC media - Analyse Opinion Critique (in French). 2018-10-22. Retrieved 2019-01-06. ^ "Una retrospectiva del grupo Art & Language" (in Spanish). lavanguardia.com. 2014. ^ "El MACBA rep 800 obres d'Art & Language" (in Catalan). ara.cat. 2011. ^ "Petit Journal" (PDF) (in French). jeudepaume.org. 2016. ^ "Art & Language uncompleted: The Philippe Méaille Collection". macba.cat. 2014. ^ "Montsoreau-Polémique : faut-il confier le château à un collectionneur ?" (in French). courrierdelouest.fr. 18 June 2015. ^ "Le château de Montsoreau cédé à un collectionneur ?" (in French). ouest-france.fr. 20 June 2015. ^ "Chçateau de Montsoreau, un pied dans la Loire, l'autre dans l'art contemporain" (in French). angersmag.info. 20 June 2015. ^ "De l'art contemporain au Château de Montsoreau" (in French). ouest-france.fr. ^ "Peintures et Badigeons à la chaux" (PDF). mpflimousin.free.fr. 23 May 2008. ^ "Réouverture du port historique du Château de Montsoreau". saumur-kiosque.com. 2017. ^ "Famille de Chambes". geneanet.org. 2000. ^ "Charles VII et Louis XI". valedeloire.org. 2000. ^ "Renaissance à Venise". Atthalin. 2000. ^ "Art & Language empêcheurs de tourner en rond" (in French). artpress.com. 2016. ^ "El Valle del Loira y todas sus novedades para el verano". ELMUNDO (in Spanish). Retrieved 2017-08-13. ^ "Tateshots Art & Language". tate.org.uk. 2014. ^ a b "Art & Language". tate.org. 2008. ^ "Collection Art & Language". artgallery.nsw.gov.au. 2000. ^ "Dossier pédagogique Art Conceptuel" (in French). centrepompidou.fr. 2007. ^ "Kathryn Bigelow life in Arts". castillocorrales.fr. 2000. ^ "Art & Language". mam-st-etienne.fr. 2000. ^ "Art & Language Uncompleted". macba.cat. 2014. ^ "Agnès Thurnauer-Art & Language : une pensée commune de l'art" (in French). lequotidiendelart.com. 2016. ^ "Agnès Thurnauer: a History of Painting". e-flux.com. 3 August 2016. ^ "Ettore Sottsass ou la liberté guidant l'artiste" (in French). lemonde.fr. 2017. ^ "The Met celebrates Ettore Sottsass: the designer who put the fun into function". Financial Review. 2017-08-14. Retrieved 2017-08-15. ^ "Prix François Morellet | artpress". artpress (in French). Retrieved 2018-01-21. ^ "Prix François Morellet". Château de Montsoreau-Museum of Contemporary Art website. 2017. ^ "Bernar Venet lauréat du Prix François Morellet 2019". daily.artnewspaper.fr. Retrieved 2019-04-18. ^ "Wild Garden - Homage to Miriam Rotschild | Jardins Val-de-Loire". jardins-valdeloire.com. Retrieved 2018-01-21. ^ Martin, Douglas (2005). "Miriam Rothschild, High-Spirited Naturalist, Dies at 96". The New York Times. ISSN 0362-4331. Retrieved 2018-01-21. ^ Tucker, Anthony; Gryn, Naomi (2005-01-22). "Obituary: Dame Miriam Rothschild". the Guardian. Retrieved 2018-01-21. ^ "EXPO CHICAGO 2016 /Dialogues: ART & LANGUAGE Symposium | Conceptual Paradise". 2016-10-12. Retrieved 2017-08-03.